4.1. As per section 204(i) of the Act, in the context of payments other than payments by the Central Government or the State Government the "person responsible for paying" for the purpose of Section 192 means the employer himself or if the employer is a Company, the Company itself including the Principal Officer thereof. 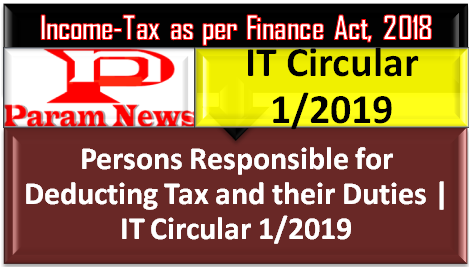 Further, as per Section 204(iv), in case the credit, or as the case may be, the payment is made by or on behalf of Central Government or State Government, the DDO or any other person by whatever name called, responsible for crediting, or as the case may be, paying such sum is the "person responsible for paying" for the purpose of Section 192. 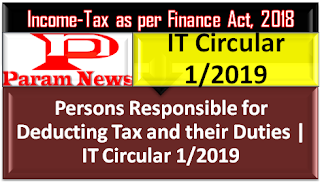 If the jurisdictional TDS officer of the employer issues a certificate of No Deduction or Lower Deduction of Tax under section 197 of the Act, in response to the application filed before him in Form No 13 by the employee; then the DDO should take into account such certificate and deduct tax on the salary payable at the rates mentioned therein. (see Rule 28AA). The Unique Identification Number of the certificate is required to be reported in Quarterly Statement of TDS (Form 24Q). If the PAO/CDDO/TO etc, as stated above, fails to deliver the statement as required u/s 200(2A), he will be liable to pay, by way of penalty, under section 272A(2)(m), a sum which shall be Rs.100/- for every day during which the failure continues. However, the amount of such penalty shall not exceed the amount of tax which is deductable at source.